You have created a long learning journey and you would like to offer learners the possibility to directly start an activity without having to scroll down. You want to help learners decide with which activity to start. 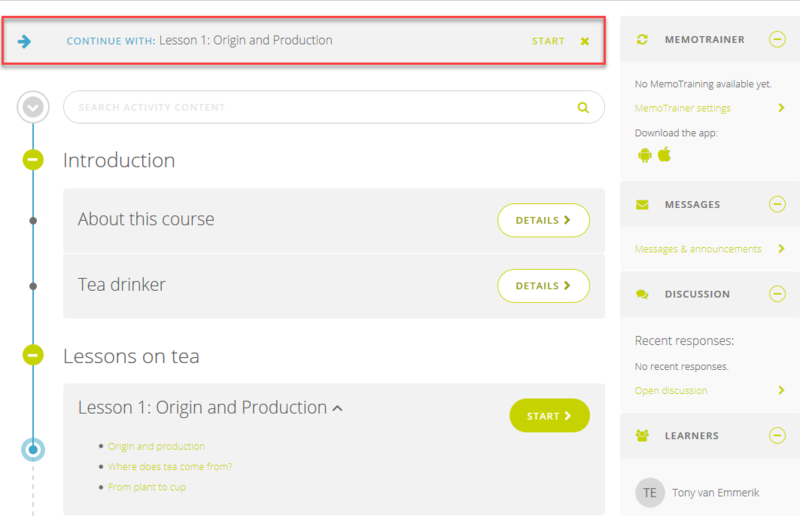 You want to make it easy for learners to continue with the next activity in queue. You want to stimulate learners to finish activities in the order that they are placed in the learning journey. Click the Templates tab and Edit. Go to the Template tab. There you will find the Personal learner advice. When using the advice box, learners will see an advice on top of their learning journey that contains an activity to start right away. After learners finish an activity, a popup with advice will appear. This setting concerns the Progress in the example below. This concerns the Advice in the example below. The learner can now click Start at the advice to start the advised activity. If you disable this option, the learner will only have the option to go back to the overview. If you turn off both options, learners will go to the next activity right away after completing an activity. Which activity this is, depends on how the advice works. Which advice learners get, depends on the settings. Check this option when you have created an adaptive learning journey. The advice will depend on the learning objective that needs most work to be completed. Only activities in adaptive blocks will be advised. Let's say that the learner starts their 3rd activity in the learning journey. After finishing it, the advice will be to first finish the first activity. The advice will be the next activity after the current activity in the learning journey. Let's say that the learner starts the first activity, but skips to the last content part right away. The advice will be to continue this first activity, because it hasn't been completed. Tutorial: How do I create a simple learning journey? 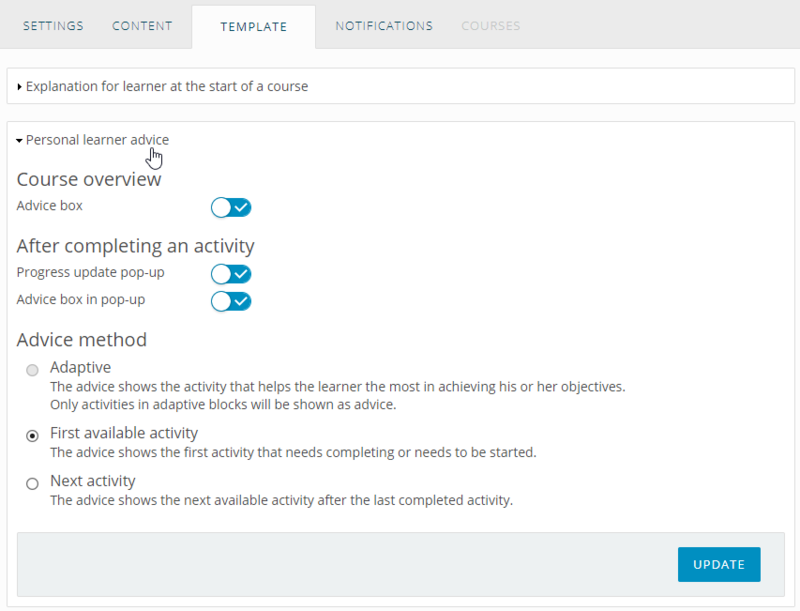 Tutorial: How do I create an adaptive learning journey for the learner?